Since January, Marin Transit (MT) officials have been renegotiating their contract with Golden Gate Transit (GGT), which currently provides the bulk of local service throughout the county. MT says they’re paying GGT too much to operate the local routes and want to lower the contract’s $16 million cost. This makes sense, given MT’s rather severe budget crunch, but from a rider’s standpoint the marriage has been more than simply money. Unified bus service has put Marin head and shoulders above the balkanized systems in other counties, especially Sonoma. Keeping it intact, or at least keeping inter-operator cooperation, is vital to transit in the North Bay. While high-level debates of who runs what buses where are important to those who run the buses or those who pontificate about those who run the buses, regular riders typically don’t care. They get where they need to go whether it’s on GGT, MT, or Muni. It’s like passing from one jurisdiction’s roads to another. Drivers don’t care who maintains the the roads as long as they work. The seams between transit agencies are rather more visible than the seams between roads, though. Transfers, schedules, routing, maps, branding, and more all serve to differentiate one system from the next. Within the Bay Area, not all transit agencies even have the same fare medium, forcing people transferring from one to the other to carry a Clipper Card and pounds of assorted change. Transfers aren’t always honored between agencies either, needlessly increasing costs for riders. To use the driving metaphor again, imagine buying a local road map that left out all the state-owned roads and highways, requiring you to buy a second map that only shows state-owned roads and highways. Drivers would never put up with such a thing, but that’s the situation in the Bay Area. SPUR has argued for a more integrated system for the whole Bay Area, unifying the various systems’ branding, maps, and fare structures while keeping the agencies separated. It would also allow agencies to pick up and drop off passengers within other agencies’ areas. 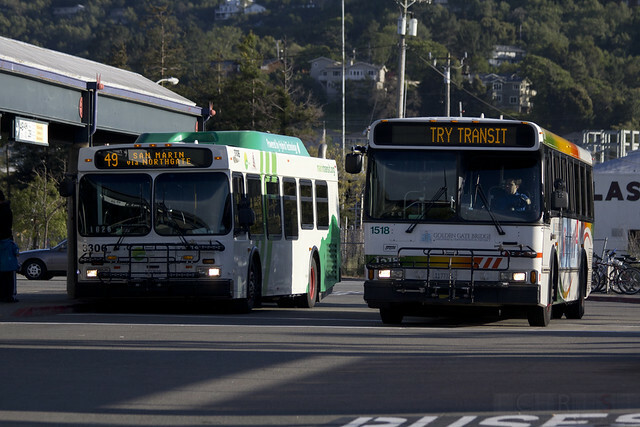 GGT buses, in other words, could pick up someone along Van Ness and drop them off at Lombard, or AC Transit could start running buses through Marin. While this is an ideal situation, it’s a long way from current reality in most of the region, with one exception: Marin. Marin’s local contracting scheme with GGT has given Marinites a mostly integrated local and regional transit system (shuttles and Stagecoach aren’t seamless with regular operations). Transfers are easy and painless, GGT can operate throughout Marin as it sees fit, and riders are none the wiser. Even bus branding, while different, is similar enough that buses blend easily. 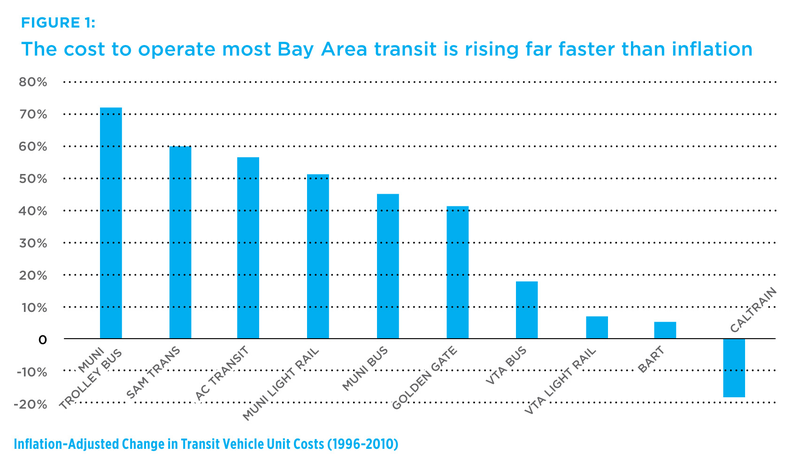 Alas, the benefits to riders have come at a steep price for Marin Transit. GGT’s contract mandates 5% increases in payments every year, a hefty cost for the tiny agency. GGT’s contract also slows service changes dramatically. Change to Tiburon bus service, for example, will take an astounding 18 months to implement. Other improvements, such as real-time arrival service, have been offered on Stagecoach for years but still aren’t part of the GGT-operated lines. Though these cost increases are slower than other regional agencies, the contract’s slow-walk of service changes means Marin Transit can’t respond to lower or higher demand in a timely fashion. The constantly increasing costs, too, have put MT on an unsustainable financial path. They’ll be out of reserves by the end of FY2014, and out of money entirely by FY2017. MT has a responsibility to taxpayers and riders to stay in service and should negotiate hard for a better and sustainable contract. If it can’t come to an agreement with GGT, it should find another provider. But both GGT and MT should keep in mind the benefits of a unified transit service for the county. For the sake of Marinites, I hope they can make this partnership work.